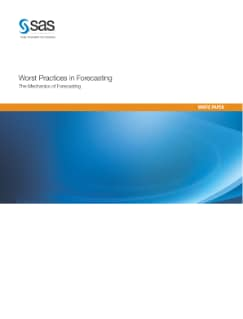 There is no shortage of articles, books, consultants and vendors telling you (or selling) their version of forecasting best practices. This white paper takes a different angle. Instead of talking about the so-called "best practices" in forecasting, we will instead expose the seamy underbelly of the forecasting profession. Rather than asking you to implement all the various things that really good forecasting organizations do, we want to help you avoid the really bad forecasting practices that some organizations fall prey to. Perhaps the surest way to achieve process improvements is by identifying and eliminating the worst practices in forecasting.